If you've been a regular reader here at The Book Chook, you'll know I have a fascination with story in all its forms. I love great children's literature, games of charades, songs, poetry, playground skipping games, stop-motion videos, web 2.0 tools for creating stories online, improvisation games, magazines, word games, imaginative activities, art, music, comics, cartoons, catalogues - in short, just about anything that involves kids in reading, writing and expressing themselves with fun and creativity. Over the past sixteen months of The Book Chook's cyber-existence, I've shared lots of ideas for incorporating activities into everyday life to develop literacy. Today, in honour of Day 2 of the Share a Story Blog Tour and its theme, Literacy My Way, I want to list a range of exciting online places where kids can express themselves through story. As I said in What's the Deal with Online Publishing? "sites like these give a voice to young people and allow them to reach out to a global audience. By sharing their stories, they enable us to gain a greater understanding of some of the problems facing kids today. By sharing their stories, I believe young people contribute to making our world a better place, and help to shape their own futures." For those of you who are new to The Book Chook blog, it might be the first time you've encountered online story editors, so, as well as a brief comment, I will embed links to my earlier reviews of them. For others, I hope it might be useful for you to have these in one handy place, and for you, I will embed the site url, and attempt to categorize them. Many of these websites have a gizmo (chook-speak for technology far beyond my understanding) that enables you to write your words, create accompanying artwork, and publish a little book. Kids can often read others' creations there too. Reading the stories other children have written is wonderfully motivating, and encourages a child to write for an authentic audience. So much more real than churning out a description of a family holiday to be read and corrected by the teacher! Reading and writing are inextricably linked, and great writing is fuelled by lots of reading. Some websites allow kids to create their own cartoons or comics, others enable slideshows and posters. All of them are free (or free at the basic level) and most come with The Book Chook Feather of Approval. This means they are simple enough for a featherbrain like the Book Chook to use! StoryJumper/Book Chook review - you can use your own artwork or photos to create books, or create with the site's own. If you want the book printed, you must pay. It also offers story starters to prompt your writing, very handy for kids who stick before they start. Little Bird Tales/Book Chook review - has a free trial you can use. It offers the feature that you can record your voice too. Bookr/Book Chook review - create and share your own photo book with Flickr images. This is very simple, and best if you have very young kids who want to make a caption book. My Story Maker/Book Chook review - the Carnegie Library offers this little digital book creator. Cute. It has a helper to make suggestions for you. Pinky Dinky Doo- only half a feather because the voice and music give me ear worm! Its repetitive nature and text highlighting will help younger readers though. My post about Using Toys as a Springboard for Writing has some other ideas you might like. xtranormal/Book Chook review - I haven't used xtranormal's State, because it's for PC, but I've used the free version of xtranormal. It's a little trickier than the story editors above, but lots of fun to play with camera angles, write scripts, and choose your actors etc. Making a little movie to tell a story - wow! ZimmerTwins/Book Chook review - based on TV show characters, the editor is one of the simplest around. Drag and drop features to make your own little movies. Kerpoof - I haven't had time to play with Kerpoof much yet, but Kelly Tenkely of ILearnTechnology blog loves it, and that's good enough for me. Not just movie creation at this site, but cards, books and drawing too. D'volver/Book Chook review - very simple to use, unusual characters to choose from. Young teens would like it I think. Toon Doo - my current favourite place online, Toon Doo is so handy when you want to create a quick cartoon. To celebrate Literacy My Way, I've tried to make all the pics for my own articles this week at Toon Doo. You can also make comic books, and the site has a range of other art editors. Such a cool and fast way to express yourself and get a digital result you can email, embed, keep private or share. Two feathers for sure, and a review soon too. Cartoonist at Creaza/Book Chook review - this is a little more complicated, but very cool. Cartoonist is just one of three features at the Creaza main site, which includes a movie maker. Cartoonist supplies the art work for you to arrange, space for your text, and a simple enough interface to win that coveted feather of approval! Make Beliefs Comix/Book Chook review - doesn't have as many bells and whistles as more modern technology but is still a great place for kids who want to do some quick writing and use fun illustrations. Myths and Legends/Book Chook review - again, this one isn't the most recent editor, but it has all the ingredients kids need to make interesting stories in digital comic book form. Professor Garfield Comics Lab - log in to save your work. Review coming. PhotoPeach/Book Chook review - I love PhotoPeach. It's easy, it provides a little quiz option for your slide shows, you can add text to make them little digital books, and it's been around long enough to make me think it will last. Offers music free for you to use. Feather of approval for sure. Photoshow/Book Chook review - no feather of approval. Similar to PhotoPeach, with added cute stickers, so originally I loved it. BUT they don't store your story longer than a month. I understand these sites are businesses, and need to make money. It's just I prefer the generous ones who let us use the basic product for free, and keep it going. Stupeflix/Book Chook test - another slideshow maker, with an option of including minimal text. I like the look. You can upload to YouTube to get the embed code. I haven't posted about it yet (end of week probably), but I've used it, and it inspired me to write some words about the photos I chose. Kids who are daunted about writing "a lot" might enjoy taking their own photos and creating short text to accompany them. You need to source your own music for this one. I've read good things about Flixtime but haven't had a chance to play (ahem) research there yet. Story doesn't have to be in the form of a narrative. We can use words and images, even music, art and video to express ourselves online, and so can our children. Glogster/Book Chook review - make a poster online that can include text, images, music and video. Notaland/Book Chook review - like Glogster, perhaps simpler. Same guys that produced PhotoPeach. They call it an online whiteboard. I call it a poster. PicLits/Book Chook review - a great way to encourage kids to write poetry. There are many more, but I've tried to stick to my favourites here. I hope you'll encourage your kids to play with these tools. It's a great way to enjoy being creative, and develop literacy skills at the same time. Technology is so inherently motivating for kids, it might just be something that gives them a reason for writing. 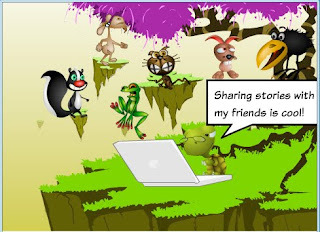 If you know spaces online I didn't mention, that you think inspire kids to share stories, I'd love you to post them in the comments, or share the link to your own post about them. What a fantastic list! My students are using www2.shidonni.com to create books about a Winter Olympic event right now. They love writing and creating this way. Hi Guest! I have heard such great things about Shidonni, but I am using a Mac and not sure if the download Shidonni needs, Microsoft Silverlight, will clash with it. So glad to hear your kids love reading and writing this way! Thanks for leaving the link. What a great resource! I can't wait to share this list. OK, fine. I can't wait to play at more of these sites, too. Greg, they are such good fun for adults too. Well, either that or I am easily amused! Wow, we've used, and blog about Bookr, based on your blog post in the past. There's a lot more to have a blast with here. WOW - you have a ton of resources here, I'm going to be busy checking them all out!! Thanks, Susan. 16 months? That's all?! With all the stuff you share it seems like you've been with us for years! Love the Chook rating system. I noticed some new ones ... we've played with Photo Peach, but I will say that the princess prefers building on avatars/images/cartoons that exist and she can add to with an existing set of choices. For learners like her, having a framework and limitations helps with focus. Yay Ian! And the great thing is, most of these only take a little while to sort out. The interfaces are becoming simpler, and using drag and drop to make it more user friendly. I know it will seem almost overwhelming, Melissa, but I wanted to put the good ones I'd reviewed into one post and figured this was the week to do it. One of the things I observed time and again as a drama teacher Terry, was that limitations and frameworks actually prompt more creativity than having none. This is with kids and adults too. It's almost like with no limits, there are way too many choices and we just can't get started. Many of these have a gallery where she can see what other kids have done. But of them all, for your princess, maybe StoryJumper with its starter prompts might be best. The story is begun and the young writer continues it. I love Storybird, but there mightn't be enough framework for her there. Still, let her take a look and decide for herself. She'll likely have it sorted in two minutes! Susan, what a great story on your journal! I'd never thought of your method but as you say, it was worth every penny! I find myself wishing these sites had been around when my son was young too. Now I just drop hints about grandchildren, but nobody's listening! This list is great! I'm curious, what is the youngest age that you would recommend for your favorites? I have a soon-to-be kindergartner, but have been hesitant about using these with him. Are there certain ones you would recommend for certain ages? I think I would leave it to you and your son, Tif. You two will know when he's ready to use online story editors. I would take a stab and say seven, but then, that is arbitrary and won't be true for every child. Signs he might be interested could be he's developing skills in computer like controlling a mouse, and showing interest in online activities. Does he go to sites like Poisson Rouge and want to interact with the features there? Or he might be starting to create his own stories. Perhaps orally, or even writing words or sounds or scribble stories that he wants to read to you. I guess I would say read and write and draw lots with him first, and then if he's interested in the computer, have him take a look with you. If he loves to read, and is beginning to read a little independently, I would think Bookr might be a great place to visit together. Making a little caption book about his favourite toys say might help him understand the link between reading and writing. Thank you for this list. Sue Berger told me about this in email today. What a great find! I expect to be making use of this with my 4 yr. old this weekend. Great stuff! That's great KKahrs. Thanks so much for the feedback! Thank you so much for sharing. Love the way you have divided them into different categories. there are some here that I am definitely going to try out. I'm so glad you will benefit from the list, Steph - I know I benefit from all your lists! Wow, so many choices so little time! Thanks Book Chook, an amazing list. I am going to start small with storyjumper as I think my writers will like and need some help getting started but I know I would love to use storybird. Hopefully I can find the time to trial a few more this year. They certainly will start us on the path towards multimodal texts as required in the new curriculum. You are so right about the authenticity of this kind of writing my class are blogging and have used xtyranormal with great sucess. Please let us know how your young writers go with Storyjumper, Henrietta. I think you have Grade 5 - I predict they will find it fairly intuitive. The trick with all of them I think is to allow the kids time to play first, while they get used to the editor. And with Storybird what i have found is it pays to look at all of the available artwork for the illustrator you choose, and try to work out your story from there. It's not much use having the story go one way with no art to suit. Here's a nice place for kids to share their artwork!